ARLINGTON, MA – The Town of Arlington is pleased to announce that it was awarded a Municipal Vulnerability Preparedness (MVP) Action Grant in the amount of $399,260 to develop and implement ecologically sensitive flood management measures in the Mill Brook Corridor. 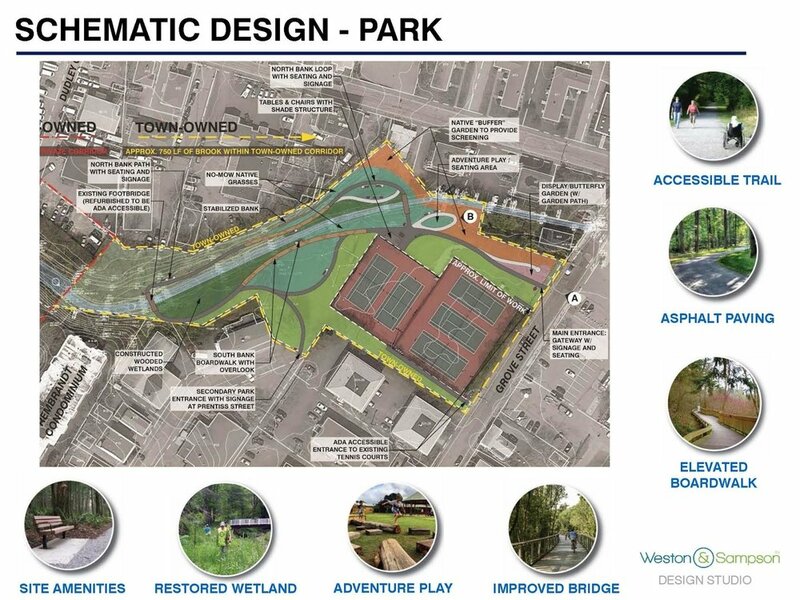 This project will build on a current initiative, undertaken by the Mystic River Watershed Association (MyRWA) and funded by the Community Preservation Act (CPA), to improve public access and recreational opportunities in the Mill Brook Corridor at Wellington Park, and in other areas of the park. Phase II of this initiative, supported through $171,420 in CPA funding and the MVP Action Grant, will be starting in July. "Flooding along the Mill Brook corridor has been identified as a major vulnerability exacerbated by climate change," said Arlington Town Manager, Adam Chapdelaine. "This is a great example of the planning process and collaboration of all stakeholders to address this vulnerability and directly leverage CPA resources to reach common goals." which involved stakeholders representing a broad-cross section of the community in an intensive 8-hour forum designed to assess local vulnerabilities to hazardous weather events and develop action steps for addressing them. The top priority identified through the workshop is addressing flooding in the Mill Brook Corridor, which has recently caused significant damage to homes, businesses, and other properties in the brook's vicinity. The Action Grant process will enable the Town to begin to address this priority through an environmentally sustainable lens. "The state's awarding of both MVP Planning and Action Grants to Arlington recognizes the Town's farsighted efforts to address the local impacts of climate change," said Ann LeRoyer, chair of the Open Space Committee and member of the MVP Core Working Group. "This flood management project in the Mill Brook corridor can serve as a model for other mitigation opportunities along the brook in the future." Arlington was one of 24 cities and towns across the Commonwealth awarded grants for projects to improve resilience to climate change. The MVP Action Grant is the second phase of the MVP program, which along with other state and local partnerships, is intended to build on outcomes from the state-funded and community-driven comprehensive assessment of municipal climate change hazards. There are currently 156 MVP communities across the state. "We are thrilled that the Commonwealth has awarded the Town of Arlington nearly $400,000 in Municipal Vulnerability Preparedness (MVP) Program Action Grants funding," Amber Christoffersen, Greenways Director for the Mystic River Watershed Association, said in a statement. "It is the second largest grant given out statewide under this program, an acknowledgment of Arlington's great work to substantially improve public access, recreation and habitat in Wellington Park while managing chronic flooding along Mill Brook." For more information, please contact Nat Strosberg, Senior Planner in Arlington's Department of Planning & Community Development: nstrosberg@town.arlington.ma.us.